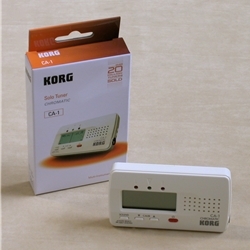 Korg's improved pocket digital chromatic tuner features easy-to-read LCD meter, wide pitch range (C1 to C8) and calibration range (A=410 to A=480hz), manual and auto modes, auto-off function, and reference tones from C4-C5. It uses two AAA batteries (included). A terrific tuner for a tiny price!